What Are The Benefits Of Strength Training For Kids? Is Slow Speed Strength Training Safe For Kids? Does Strength Training Damage Growth Plates? Is Strength Training Really Effective In Kids? Isn't Aerobic Exercise More Important For My Child's Health? The American writer Mark Twain is known for his witty and poignant remarks. He is credited with having said: "The truth is easy to kill. But a lie well told is immortal." I want to state up front and center that if done correctly and with proper supervision, weight lifting or strength training is completely safe for kids. I'm sure that you've heard around the playground and in the schoolyard that weight lifting is dangerous for children. Even some doctors still hold this myth as a truth. The common thought by people who don't know better is a fear of damage to the bone growth plates. Yet there has never been a single such case ever reported in medical literature. Others say it can delay a child's musculoskeletal development, when the opposite is true. Studies have proven that strength training actually benefits musculoskeletal growth in kids-dramatically so. In an eight-week study on fifth graders, 20 boys and girls strength trained twice a week for 20 minutes and improved their body composition almost twice as much as their nontrained peers. In a similar study using 11th grade ice skaters, almost the exact same results were achieved.' In another study conducted qver one year with nine-year-old girls, the results of strength training showed a 6 percent greater increase in bone density than those girls who did not strength train.' And while in this study a so-called high-impact- strength training protocol was used, no injures were reported. It is also important to note that the researchers in this study, after scrutinizing the data, determined that increases in muscle (lean) mass was the primary reason why bone density and all of the other positive outcomes were achieved. As mentioned earlier, one safety concern regarding weight lift­ing or strength training in children involves growth plates. The growth plate, also known as the epiphyseal plate, is the growing tissue near the end of the long bones in pre-adults. Every long bone has two or more growth plates at each end. The growth plate determines the ultimate length and shape of the adult bone. When growth is completed, which occurs at some point during adolescence, the growth plates close and are replaced by solid bone. A common misconception is that strength training can somehow injure a child's growth plates. When and how this myth got started is a mystery. It is simply not true. Perhaps the myth was conjured up by the misconception of what strength training is. According to an article by the National Institutes of Health (NIH), the cause of most growth plate injures is acute trauma such as a bad fall (gymnastics), a strong blow to a limb (football), or overuse (long-distance runners). In fact, with proper supervision, strength training is so safe for youngsters that there is no specific age limitation. Let me repeat, any child of any age can safely participate in a super­vised strength training program. Having said that, not all young children can or will take instruction or follow directions well enough to perform the exercises safely or in a manner that will benefit them. As a parent, you have to determine for yourself if you think your child is mentally ready and capable of following the specific instructions for doing the exercises properly. In my training programs, I have seen children as young as six years old who are able to follow instructions properly in order to safely perform strength training exercises and benefit from them greatly. My own daughter was one of them. Absolutely! In one study, a group of ten-year-olds increased their overall strength by 74 percent, including a 41 percent increase in chest press strength, after only two months of strength training done twice a week.' They also increased their lean mass by two and a half pounds and significantly increased bone mineral density. Not only that but these gains were long lasting rather than short lived. Many other studies have shown similar effects. Even the Mayo Clinic endorses and supports properly supervised strength training for children. Leading fitness expert Wayne Wescott, Ph.D., has said, "In one of our public school studies, the underfit and overfat fifth graders who participated in a basic and brief strength training program gained significantly more muscle and lost twice as much fat as a matched group of students who did not perform a strength exercise. Perhaps, most important, the strength­trained students made such noticeable physical improvements that the strength exercises were subsequently included in the standard physical education program.'" 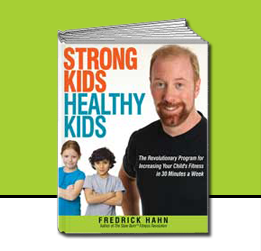 This book will allow you to implement the same type of strength program that the kids in the aforementioned study performed making your child faster, leaner, stronger, happier, and healthier. No. And there is a difference between aerobic exercise and cardiovascular exercise. All aerobic activities such as running or swimming require cardiovascular (heart and lung) work. But so do the power sports like strength training, wrestling, or sprinting. Strength training, performed properly, challenges the cardiovascular system more than adequately enough to keep your child's cardiovascular system healthy. Strength training alone will not make a child a champion runner or swimmer. For that you must attain a high level of skill at the sport. But she does not need to be an aerobic champion to have a healthy, strong cardiovascular system. If she already enjoys aerobic activities, adding slow speed strength training to her aerobic activities will allow her to perform these activities better, safer, and for many years to come because the muscles are really the engines of the body. The muscles are the boss of the body. The heart and lungs merely go along for the ride the muscles take them on. Moreover, slow speed strength training is all she needs to pass a routine physical exam with flying colors. Strength training is more potent than aerobics for all the benfits that a doctor checks in a routine physical exam, including cholesterol, blood pressure, body fat, insulin sensitivity, bone density, and more. First, let me quote one from a well-respected exercise physiolo­gy textbook: "At slow speeds the maximum number of cross­bridges can be formed. The more rapidly the actin and myosin filaments slide past one another, the smaller the number of links that can be formed between the filaments in a unit of time and the less the amount of force is developed." Boiled down, what this means is that if you move your limbs very quickly when lifting weights, the stimulus is less effective. Therefore, the quality of the contraction of the muscle is enhanced when the speed of movement of the muscle fibers is slow and when the speed is fast, the quality is decreased. We should always look to increase the quality of anything we do, so why should the work of the muscle be any different? Research performed by Wayne Westcott, Ph.D., confirms this research: "The study assessed a way to increase the intensity and effectiveness of resistance training by comparing training with a slower repetition speed to training with a conventional repetition speed. Slower repetition speed may effectively increase intensity throughout the lifting phase while decreasing momentum." What slow speed strength training does is improve the quality of the weight lifting program. And in my experience, it's the quality not the quantity of an exercise program that leads to superior results.